A whole lot of things gone in the official kickoff of Mobile World Congress 2015, but a unique phone with a curved screen on both sides of the device acquired everybody’s attention. That’s what unveiled by Samsung late Sunday. Samsung has officially unveiled its next-generation flagship Smartphones — Samsung Galaxy S6 and Samsung Galaxy S6 Edge. This time, the company didn’t just focus on the specs and features, but also on design — unique and sleek. 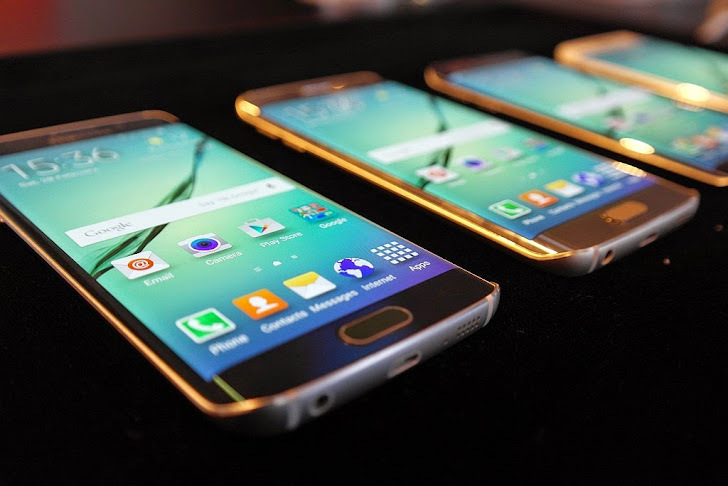 Both Samsung Galaxy S6 and Samsung Galaxy S6 Edge comes with a sleek glass-and-metal body on the front and back. On one hand, the Samsung Galaxy S6 Edge has a screen that curves around both sides with a comfortable grip, giving the phone a much smarter look. While, the Samsung Galaxy S6 has the most beautiful appearence to ever exist in the entire Samsung's S series. The new Galaxy smartphones are made of 'stronger metal' and comes with the toughest glass, Corning Gorilla Glass 4 protection, which makes it harder to bend. The Gorilla Glass 4 rear panel of the new Samsung Galaxy S6 smartphones comes in attractive colors such as Topaz Blue and White Pearl, which changes appearance based on how much light is reflected off of the glass. 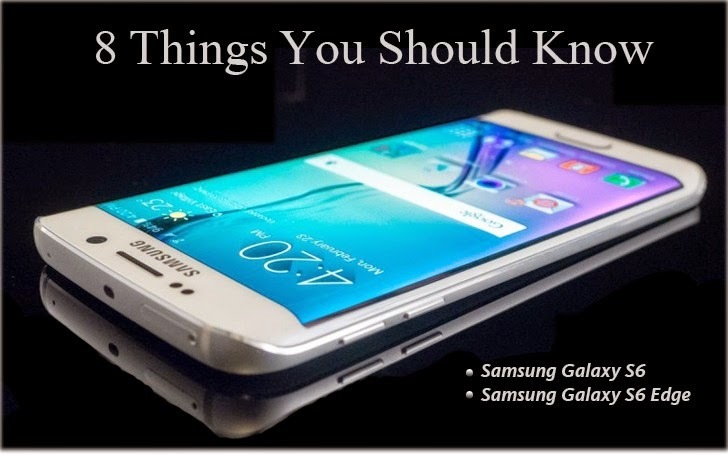 Both Samsung new Galaxy smartphones are lightweight — Samsung Galaxy S6 is 6.8 mm thin and weighs 138g, while the Samsung Galaxy Edge is 7.0mm and weighs 132g. The new Galaxy smartphones' design looks and feels pretty sweet and attractive. The brand new Samsung Galaxy S6 and Galaxy S6 Edge support WPC and PMA wireless charging, so you can now charge the smartphones wirelessly. The new wireless charging technology adopted by both the smartphones set a new industry standard for universal wireless charging. The Samsung Galaxy S6 has a 2,550mAh battery, while the Samsung Galaxy S6 Edge has a 2,600mAh battery. The battery for both smartphones lasts for up to 12 hours on Wi-Fi and, Samsung claims that they supports incredibly fast wired charging, "faster than any other smartphone in the industry." Samsung claims you'll be able to get four hours of battery life with just 10 minutes of charging the Samsung Galaxy S6. To get to 100%, the new Galaxy smartphones takes roughly half the time of the iPhone 6 to charge. The Samsung Galaxy S6 Edge is the first smartphone to feature curved display on both sides, which creates a more eye-catching display than we've seen on any other Galaxy S series. Both Samsung Galaxy S6 and Galaxy S6 Edge are strikingly similar with the same 5.1 Quad HD Super AMOLOED display and 2,560 x 1,440 resolution, which offers a very high pixel density of 577ppi. Only the difference is that Samsung Galaxy S6 Edge sports a 5.1 Quad HD Super AMOLED but with dual edge display. The camera is the another real standout feature the new Samsung Galaxy S6 smartphones have. Both the smartphones come with a 16MP OIS rear camera and a 5MP front camera, same as the Galaxy S5, but added Optical Image Stabilisation (OIS) for low-light shots and Auto Real-Time HDR for fast and easy color balance. The company says the camera will now launch almost immediately in 0.7 seconds just by tapping the home button twice on the front of either phone. Both the back and front-facing cameras offer a high dynamic range (HDR) mode that improves the contrast and low-light performance. At the launch, Samsung displayed low-light photos taken by the iPhone 6 Plus and the brand new Galaxy S6 side by side on the large screen. The latter won both for photos and video. In a video demo, a couple sitting in front of a fountain at night almost looked like silhouettes on the iPhone 6 video, but were clearly illuminated in the new Samsung Galaxy S6 video. Camera features include: Quick Launch, Tracking AF, Auto Real-time HDR(Front & Rear) , F1.9, Low Light Video(Front & Rear), High Clear Zoom, IR Detect White Balance, Virtual Shot, Slow Motion, Fast Motion, Pro Mode, Selective Focus. The Samsung Galaxy S6 and Galaxy S6 Edge are the first in series of Samsung smartphones to offer mobile-payments system. Samsung Pay, a new, easy-to-use mobile payment service, will launch on Galaxy S6 and Galaxy S6 Edge in the United States during the second half of this year. Protected by Samsung KNOX, fingerprint scanning, and advanced tokenization, Samsung Pay allows both Near Field Communication (NFC) and a new proprietary technology called Magnetic Secure Transmission (MST) payments. This means Samsung Pay will work with potentially many more machines than Apple Pay. Like Apple’s fingerprint scanner TouchID, Samsung now offers fingerprint scanner in its new flagship phone, the Samsung Galaxy S6. However, the Galaxy S6 improves more on the feature by replacing the "sliding" of your fingerprint across the button, by just pressing your finger on the screen. Just you need to do is place your finger on the sensor embedded in the Samsung Galaxy S6's home button and the phone will unlock without the need of any passcode. You can store up to four fingerprints on the device. As we mentioned above, the Samsung Galaxy S 6's fingerprint sensor will also be a key part of Samsung Pay, Samsung's mobile payments platform that will launch in the United States during the second half of this year. The Samsung Galaxy S6 and Galaxy S6 Edge are powered by Exynos 7 Octa-core processor which contain two quad-core processor clocked at 2.1 GHz and 1.5GHz respectively. On the memory front, both S6 and S6 Edge comes with 3GB LPDDR4 RAM and will be available in 32GB, 64GB and 128GB internal storage variants with support for Universal Flash Storage 2.0. On the security front, both the devices are built on the upgraded Samsung KNOX, end-to-end secure mobile platform, offering defense-grade features for real-time protection from potential malicious attacks. Both the smartphones use the 14 nanometer mobile processor with a 64-bit platform. Samsung Galaxy S5 came with a 2.5-GHz quad-core processor, whereas Samsung Galaxy S6 sports two processors — one quad-core 2.1-GHz and one quad-core 1.5-GHz, which will allow it to handle more applications with greater precision. Samsung Galaxy S5 came with 2GB RAM, 32 or 64GB storage, and Android 4.4.2 KitKat built-in. While Samsung Galaxy S6 offers 3GB RAM and storage options of 32, 64, or 128GB and comes with Android 5.0 Lollipop. Samsung Galaxy S5 screen is 5.1 inches and offered full 1920 x 1080-oixel resolution, for a pixel density of 432 ppi. While Samsung Galaxy S6 goes beyond the standard HD at 2560 x 1440-pixel resolution on a 5.1-inch screen, giving it a pixel density of 577 ppi. One restriction in the Samsung Galaxy S6 is that it doesn’t provide a microSD slot, meaning that you’ll have to pay up-front for expensive onboard storage, and whatever you buy, you’re stuck with. Whereas, Samsung Galaxy S5 doesn't have such restriction. Both Samsung Galaxy S5 and Galaxy S6 feature 16-megapixel rear cameras, but the Galaxy S6 offers a 5-megapixel front camera with more software improvements. Compare that to the 2-megapixel front-facing camera on the S5. Samsung Galaxy S6 added a number of Samsung-specific features, including S Health 4.0 and Samsung Pay, which were not included in Samsung Galaxy S5. The Samsung Galaxy S6 and the Samsung Galaxy S6 Edge will be available globally starting from April 10, 2015 and will be available in White Pearl, Black Sapphire, Gold Platinum, Blue Topaz (Galaxy S6 only) and Green Emerald (Galaxy S6 Edge only).